My Animal Eyeball. Cover photo by Michah Saperstein, 2014. The Dinner. Photos by Michah Saperstein. 2011. Twelve Green Rooms. Photos by Michah Saperstein. 2011. Twirling, the Spirit Flies Off Like a Falcon. 2009. An Arc Falling into the Bougainvillea. 2007. 30 Miles to Rosebud. 2006. The Animal I Am. 2006. Aham Asmi Aham Asmi. 2006. Found in the Park. 2003. Aerial View. Cover by Miranda Maher. 2003. In 2003, Barbara Henning began collaging photographs with text. Pamphlets are all printed on an ink jet color printer, staple binding, limited editions of 108, signed and numbered. These pamphlets were then mailed to poets and friends. 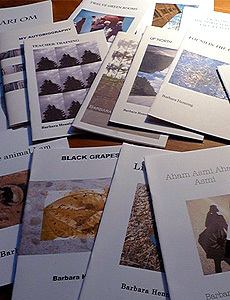 That was the beginning of what is now a collection of 16 photo poem pamphlets. She expects that My Animal Eyeball will be the last of the series. Most of the poems and photos subsequently have been published in webzines and magazines. Many of them have been collected into Cities & Memory, published by Chax Press and A Swift Passage, published by Quale Press. Unless indicated, all photos were taken by Barbara. About an earlier pamphlet, Passion of Signs by Barbara Henning and cover art by Georgia Marsh, Mark Wallace writes (in Taproot Reviews #7/8, 1996): A beautifully evocative collection of lyrical insights on love, and the social and historical framework in which it struggles to happen. These precise, well-wrought poems understand that formal innovation is never more than a function of insight–these are the sort of poems that could only arise from a life intensely felt and understood. Henning knows a great deal about the negotiations that make love possible, or make it fail, and she knows that the most evocative poetry is often that which lives closest to our own particularities. Letter from Brenda Iijima: I was absolutely thrilled to receive your delicate, thoughtful, beautifully assembled book, quite by surprise with a bunch of meaningless mail a few weeks back. The shadows and shadows of suggestion permeate my understanding of the world of thing operations and how it is. At once stark and then filigreed, a softness lingers. Cycles coming in and out of being. The final disclosure. Emptiness is not possible with such feeling. Poignant. And the photogrpahs are of the most tantalizing hues. Letter from my teacher, Esther Broner: How lucky I am to be on your mailing list—still sharing life with you—and to receive Found in the Park . . the graphics are so beautiful and who would think from Tompkins Square Park, which has undergone several lives and where I was able to bring my granddaughter, Alexandra the Great, to play in her babyhood. I love the color, the branches, the blown leaves, the autumnal and green leaves . . And the beautiful use of the leaves in the memoir. The triumph when you write, “I heard a voice as I walked down Woodward Avenue, and it was my own.” And you do have your exact, exacting voice. This is really a wonderful book. Letter from Kristen Prevelet: It was so wonderufl receiving your beautiful chapbooks in the mail—your Indian “journals”, in their disconnect simultaneous w/ intense experience—are amazing. They take me back there . . I’ve long admired your work for how you’ve merged photos and text with such clarity as to illuminate both.